We bought a T-Shirt press last year, second hand from a chap who was closing down his souvenir shop. A good, solid very old fashioned device. It came with sundry transfers and letters which he had left over from his days of making New Zealand themed T-Shirts. It also came with a supply of T-Shirt transfer paper. Since getting it we have experimented with it, made some shirts for me to wear in the shop, and had a disaster making some work shirts for the plumber next door. These failed because the fabric was coloured using dye sublimation, and I also think it was silicone treated too to keep it clean. Whatever it was, the vinyl fell off in a few days. I learned a lesson there – keep control of what garments we are decorating. 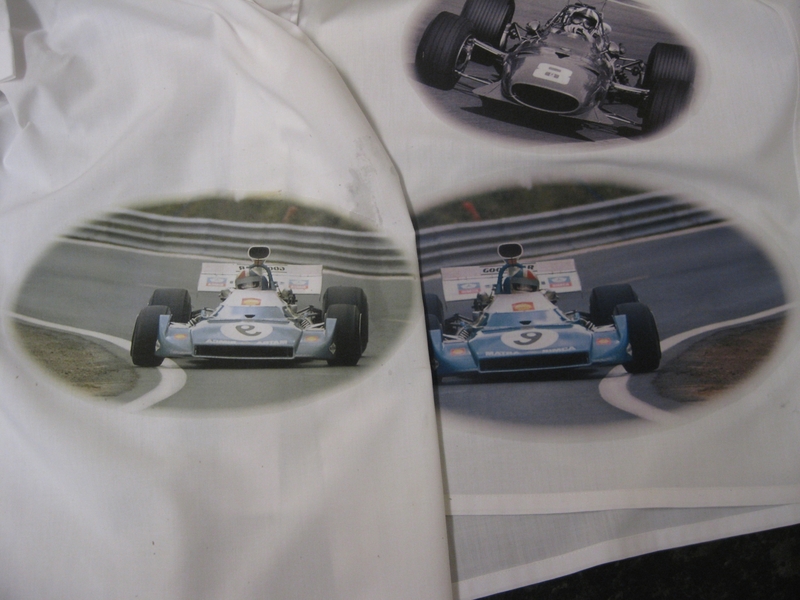 So when the local cafe owner came along wanting two images of Chris Amon racing at Oulton Park put onto two shirts, I steered him towards the T-Shirts I would have bought, from my normal supplier. As with all jobs, I decided to try out the process before getting stuck in for real. One of the images was monochrome, and I printed it up, and transferred it onto an old shirt I keep for such trials. The result was a sickly green image, like a mouldy sepia print. The rest of the image quality is down to the print heads needing cleaning. Bingo, I use an Epson Workforce WF7520 printer, which uses Durabrite pigment based inks! I have an HP printer at home, but I don’t want to be going back and forth to home to print out transfers, so I looked for alternatives. I had also been looking for a printer that would print CDs and DVDs, so I decided to combine the two problems. In the end one printer covered all my requirements, the Canon iP8760, which is an A3+ photo printer, which also prints DVDs. The inks are Dye based, with the exception of the black ink used for printing simple documents, which is pigment based. 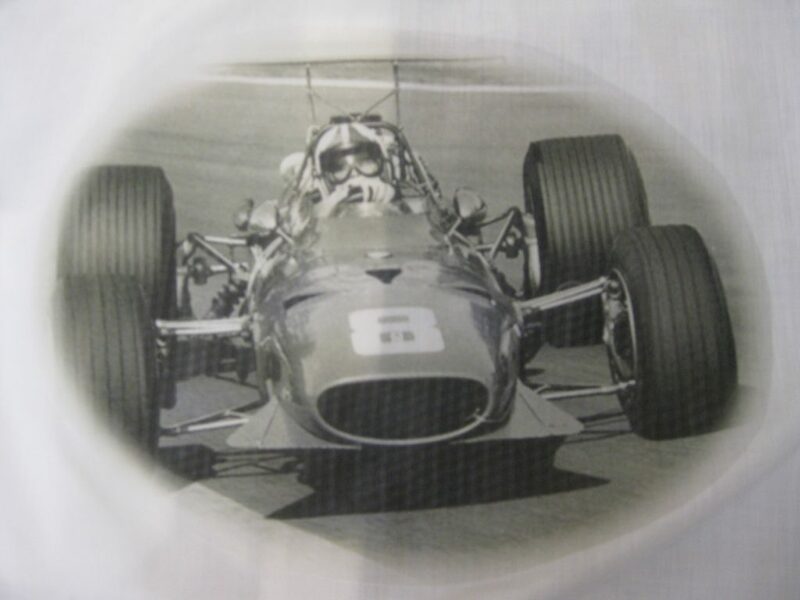 As this ink is not used printing on Inkjet Transfer paper, it is not an issue. It does make printing black and white documents cheaper though. Ordered on Thursday, arrived on Friday before I got to work, and took the whole morning to set up on three shop computers. Most of this time was spent sorting out my network, which seems to throw a tizzy whenever I try to connect anything via WPS. I printed a couple of disks to see how good it was, and then printed a couple of trial images. These were applied to the test shirt, and the colours were perfect – problem solved. The images were then applied to the two cotton t-shirts, where they look even better. So two t-shirts cost me about $500 to produce – hopefully I will get some value out of the printer and the extra paper I bought over the next few years! ‹ Electric Bikes – did I say spring?